Make your own wrapping paper, reuse, or go without. Traditional wrapping paper isn’t recyclable and each year huge amounts of this quickly torn up paper end up in landfills. Get creative! Use an old scarf or pieces of cloth, magazines or newspapers, or reuse wrapping paper from gifts you receive. Buy LED holiday lights. LED lights use 70 percent less energy than conventional holiday lights, saving energy and money. They’re also much less likely to burn out than incandescent lights and radiate less heat, making them less of a fire hazard. You can buy them online and at many major retailers. Pick up a timer for your lights while you’re shopping to double down on your green. Add organic and locally sourced food to your holiday feast. Supporting organic agriculture can reduce carbon dioxide and slow climate change, and choosing a local family farmer avoids the large amounts of non-renewable resources that go into food transport. Donate to a charity or volunteer with family and friends. Instead of a physical gift this year, donate your time or money to a cause you and your loved ones care about. Giving back to your community and the planet – from serving meals to cleaning up a local river – can help get you into the holiday spirit. Recycle or compost your holiday tree. Each year 10 million holiday trees end up in landfills. Check with your local waste provider to see if they offer a program to turn your tree to mulch or wood chips. 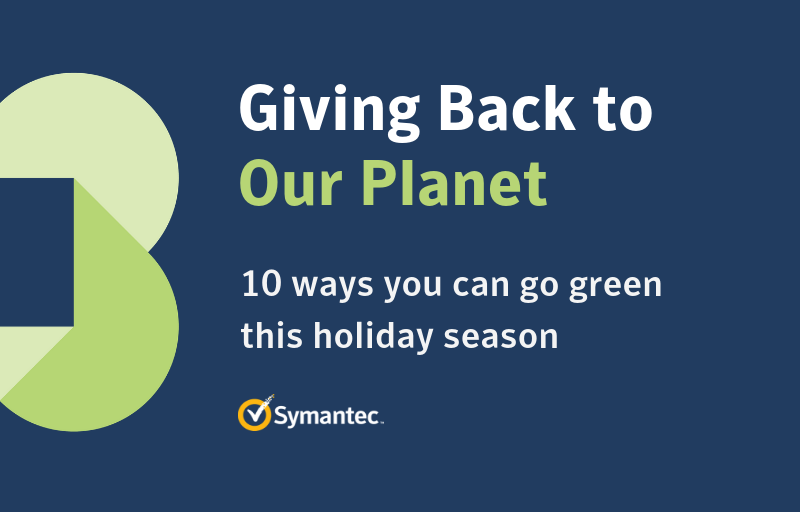 Better yet, join Symantec and plant a tree in place of your holiday tree this year with One Tree Planted and help reforestation efforts. Offset your holiday travel. Flying home for the holidays or driving to see family? Air and car travel use considerable fossil fuels. Greenhouse gases from transportation are the second-largest source of emissions in the U.S. Purchase offsets from Terrapass or CarbonFund and offset the carbon footprint from your holiday travel. Gift differently. Gift an experience this year. Tickets to a sporting event or concert, a museum membership or swim lessons, a National Parks pass, or a homemade dinner can be a great way to give your loved ones the gift of experiencing something fun, new or interesting. Want something tangible? Consider a homemade gift (a knit scarf, jar of jam, or homemade soap), gifting a used item from a second-hand shop, or ‘shopping’ in your own home for a holiday exchange. Slow down shipping. Doing your holiday shopping online this year? While one- or two-day shipping is convenient, the emissions that tag along with your goods are much higher than with slower methods. Choosing a longer delivery time allows shippers to hold delivery trucks until they are full and gives shippers time to design the most efficient route to your door. Skip disposables. This is your chance to use that fine china (or your regular dinner plates!) and cloth napkins. Americans send an extra 25 million tons of garbage to landfill between Thanksgiving and New Year’s Eve! Have guests bring items with them for large gatherings, make hot chocolate and tea in large quantities, and use pitchers to reduce waste from plastic bottles and cans. Decorate your home with items from nature. Avoid plastic decorations and opt for wood, burlap, or organic cotton. Use plants or bring in other elements from your own backyard! Pinecones and needles can create a beautiful centerpiece or holiday wreath. We’re focusing on water in India! Symantec is partnering with the Seva Sahayog Foundationon a water related project in India. The Foundation connects corporations and individuals with nonprofits in need, aiming to better the environment and create a greener future through sanitation, waste management, and cleanliness initiatives.